The Clock Tower in Hong Kong is one of the few reminders of the British ruling Times. It is located at the southern shore of Tsim Sha Tsui next to Victoria Harbour. 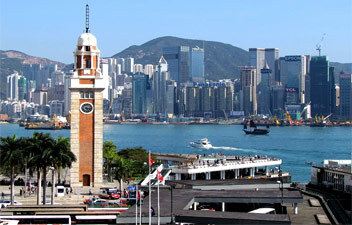 Built in 1915, the 51 meters tall Clock Tower overlooks Victoria Harbour. For the people of Hong Kong it is one of the first things to see there as like the Statue of Liberty in New York for the locals there. It is built out of granite and red bricks and is all that remains from the former Kowloon-Canton Railway Terminus. Hong Kong government has decided to relocate and move the Kowloon Station terminus to its present day location in Hung Hom in 1975.This decision has affected changes in the Tsim Sha Tsui area. Several historic buildings were lost its importance and gradually loose its majesty. Conservationists tried to stop the demolition of the original site and of the Kowloon Canton Railway Terminus, but were in veins. Gradually the Kowloon Canton Railway Terminus diminished completely and the Clock Tower is the only remnant of the former Kowloon-Canton Railway station. 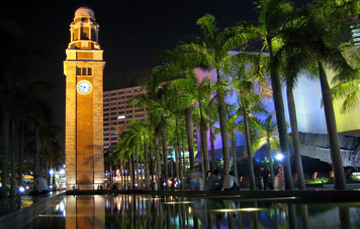 Since 1990, the Clock Tower is an official declared monument of Hong Kong. Popularly known as the Clock Tower or TST Clock Tower but its official name is Kowloon-Canton Railway (KCR) Clock Tower. The Peninsula Hotel and Star Ferry Terminal are in close vicinity to the Clock Tower and are the famous and iconic landmarks since years. It was believed that in the old days, the Railway Station with its Clock Tower were located right in-between the two significant buildings of Clock Tower and the KCR Terminus. I was helpful for businessmen, travellers and adventurers could walk within a few minutes from their hotel room at the Peninsula to the Star Ferry or board a train to Mainland China. The Kowloon-Canton Railway stood an important role in developing Hong Kong as one of the trading hubs of the world. The travelling between Hong Kong to Beijing, Russia and other European countries became easier. Also it accelerated trading with these countries with all the advantages. Today, the area around the historic Clock Tower is a famous meeting point and sightseeing place. In close vicinity are the TST Star Ferry, famous Peninsula Hotel, the Avenue of Stars, the Hong Kong Cultural Centre Harbour City Shopping Mall, Terminus, the Nathan Road and Hong Kong Arts Museum. The area around the Clock Tower is often used for special events and decoration. On public holidays such as Chinese New Year and Christmas, Hong Kong government puts up beautiful decorations and illuminates them at night. It will be a marvellous to see the clock tower at night. The Clock Tower is one of the best places to enjoy the beautiful and spectacular skyline of Hong Kong and the Symphony of Lights Show and a good spot to sit down and enjoy. You may peep through one of the windows and you will be able to spot the old tower bell. It is not allowed to climb the tower as the authorities were stopped it long back. Last but not least, you often will see young couples and newly-weds taking pictures around the old Clock Tower. Take the MTR to East Tsim Sha Tsui station or the Star Ferry to Tsim Sha Tsui ferry pier.